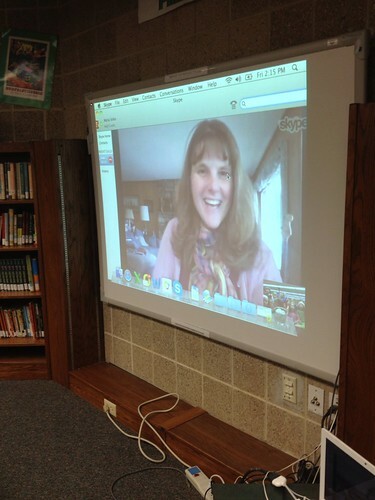 Yesterday I posted about the hurdles I had to jump to get my Skype visit set up with Kate Messner. Today? Today I'm here to tell you that it was all so worth it! I checked my computer for my "illicit" copy of Skype around 1. Then had a mild panic attack when I couldn't find it. A visit from my building techie confirmed that I was just being ridiculous - I had forgotten that she couldn't put it into my "apps" folder on my desktop, but had instead told me to look directly into my computer drive. Whoops. Getting all set up in our upper library took some doing. I had downloaded the presentation onto a flash drive, and one of our amazing tech people brought her netbook so we could show it. 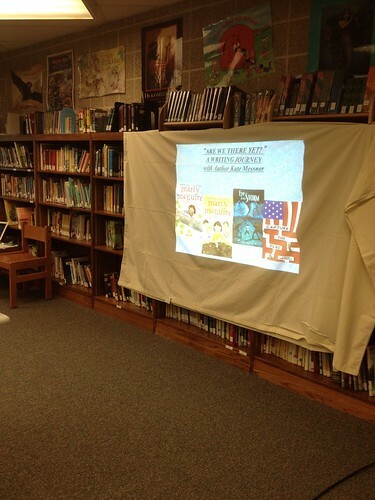 With only one screen in the library, we had to "MacGyver" ourselves another screen. Hey, we're teachers - we do whatever it takes, right? The kids arrived from all over the building - each one adding to the overall noise level. They were excited, and not a single one of them is every really quiet. I'm a gifted resource teacher, so my 3rd-5th graders aren't always "mine". Instead, they represented 10 different classrooms. I took attendance to be sure I didn't miss anyone. When 2:15 rolled around, I had my phone turned on just in case there were any problems. No glitches, no problems - just a notification that I was receiving a contact request from the amazing Kate Messner! Seconds later, and we were waving in excitement to greet her. Kate's talk was wonderful. 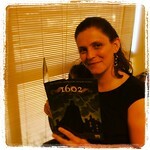 She started by sharing her own journey to the author's life. As I looked around the room, I saw the shining faces of some of my students who also dream of being a writer. She talked about the kinds of writing she did as a child, and her lack of awareness that "author" was a job you could even have. Thanks to visits like this one, my students will always know that they all could grow up to write. The best part of this section was the fact that Kate discussed ALL kinds of writing - even the little research projects she assigned to herself after her visits to the library. We also got to hear about her own favorite authors (Judy Blume and Beverly Cleary). 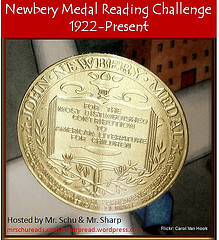 My students are avid readers, and to know that AUTHORS also adore other authors was inspiring to them. We got to hear about the whole writing process as Kate experiences it. She showed us her little "idea" journal and talked about how she always carries a writer's notebook everywhere she goes. (Yes, we tell the kids this, but they don't believe us. It's like a mom telling a child something, but they don't listen until the TEACHER says it.) Kate told us the stories behind many of her books, and now I'm dying to visit Lake Champlain and try to get a glimpse of the infamous "Champ" myself. Kate discussed her research process in vivid detail, and I watched my students leaning forward to hear all about it. I won't give away all of her trade secrets (you totally want to Skype with this amazing author), but my favorite parts were the giggles when she talked about researching what it's like to kiss a frog and the ooooos and ahhhhhhs when she talked the sacrifices she made to get the sensory details "just right" when her character eats her favorite kind of chocolate cake. I hope Kate was as pleased as I was to hear the children cheer when she brought up the books they have read and loved - Marty Maguire Digs Worms, Capture the Flag, and Eye of the Storm. Something tells me that the kids who haven't read them yet will be hunting them down in my classroom library soon! Personally, I'm super excited to read her upcoming thriller this fall - Wake Up Missing. She gave us a little peek at some of her revision notes on that one.... whooo! Shhh.... we even got to hear some secret information about Manhunt - the third book in the series that started with Capture the Flag. My students were beyond excited about this sneak peek, since many of them read CTF and have pre-ordered copies of Hide and Seek. No, don't ask me for details. I could tell you; but then I'd have to kill you. One of our district technology staff members (who was incredibly helpful in setting up the visit) stayed and was thrilled with the instructional value of our Skype. My librarian and I are hopeful that her report back to technology will mean that more students will be able to have this kind of experience without all the hoops and red tape. Thanks for a great learning experience for us, Kate - and for being an ambassador for the value of online world wide connections for my district. 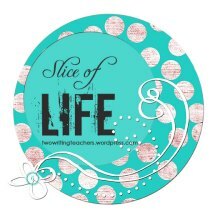 I'm participating in the March Slice of Life Challenge, hosted by the amazing educators at Two Writing Teachers. Stop by to see what others are posting!